Finally, the S&P 500 fell slightly on Wednesday as its 5 day winning streak ended. CNN fear and greed index stayed at 64. S&P 500 was down 0.22%, Nasdaq was down 0.36%, and Russell 2000 fell 0.15%. Best 2 sectors on Wednesday were technology and healthcare as they were up 0.24% and 0.36%. Two worst sectors were communication services and energy as they fell 1.49% and 0.77%. Interestingly, Snap stock rallied 22.02% because it didn’t lose daily active users. That just shows how low expectations were. I’d still rather own Facebook. The data points I review in the next section, which show stocks are overbought, won’t include Wednesday’s slight decline. But it doesn’t make a difference because the movement was so muted. As you can see from the chart below, 88% of the stocks in the S&P 500 are above their 50 day moving average. The highest percentage this cycle was in early 2016. It’s interesting because 3 years ago we were in an earnings recession and the S&P 500 is supposed to have negative earnings growth in Q1 2019. It’s still too early to tell how earnings will wind up in 2019, but the decline in earnings estimates in the first month of Q1 2019 was the worst since Q1 2016. Bulls are hoping that the estimates have gotten too pessimistic. If the economy recovers, they might be too low. I can see American growth re-accelerating later in the year, but the other developed markets don’t look as promising. The turnaround in the stock market this year has been remarkable. At the low in December, the percentage of stocks above their 50 day moving average (1.2%) was the 13th lowest since 2001. If you look at the 25 lowest points, they all have positive returns in the next 12 months with average gains of 23.4%. The 1 month gains following the December 2018 trough were 13.5%. Out of the 25 periods since 2001 with the lowest percentage of stocks above their 50 day moving average, these gains are the 5th best. Sharp gains after a very oversold point are common. I should have realized that when I stopped being bullish about 3 weeks ago. There was a negative global equity shock at the end of last year. The economic data in Japan, Europe, and China justifies a selloff more than the American data which has many pockets of strength. 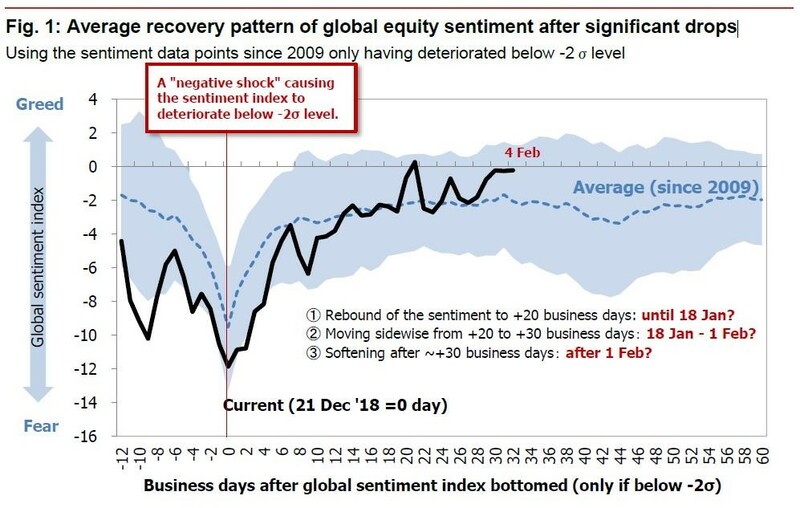 As you can see from the chart below, a negative global equity shock is when the index goes below -2 standard deviations. As you can see, since 2009, there have been sharp rallies after these shocks. The dotted line shows the average and the cloud shows all examples. As of February 4th, the market was at the high end of the cloud. The average shows market softness after 30 days which is February 1st for this market. Weak average returns 30 days after a -2 standard deviation move might be correct because there is extreme optimism in the market. 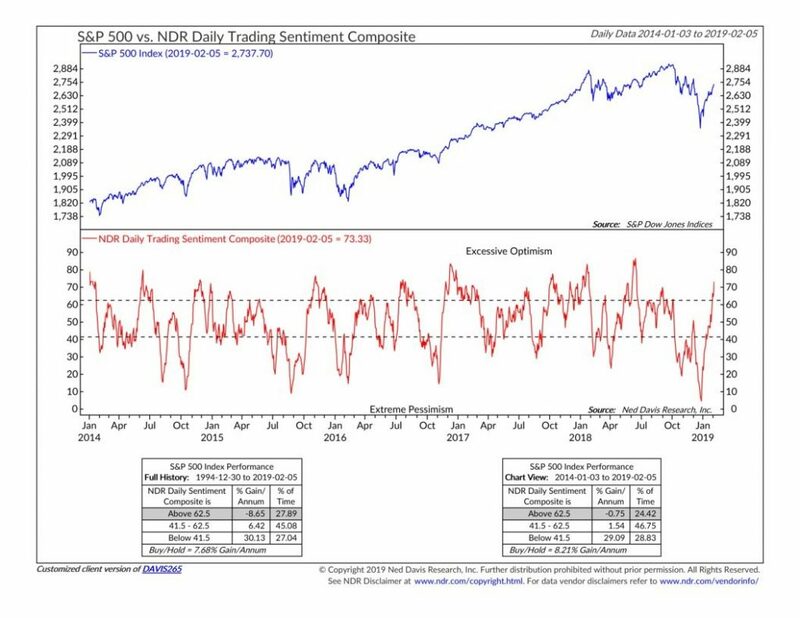 As you can see from the chart below, the NDR daily trading sentiment composite increased from 66.67 on January 31st to 73.33 on February 5th. 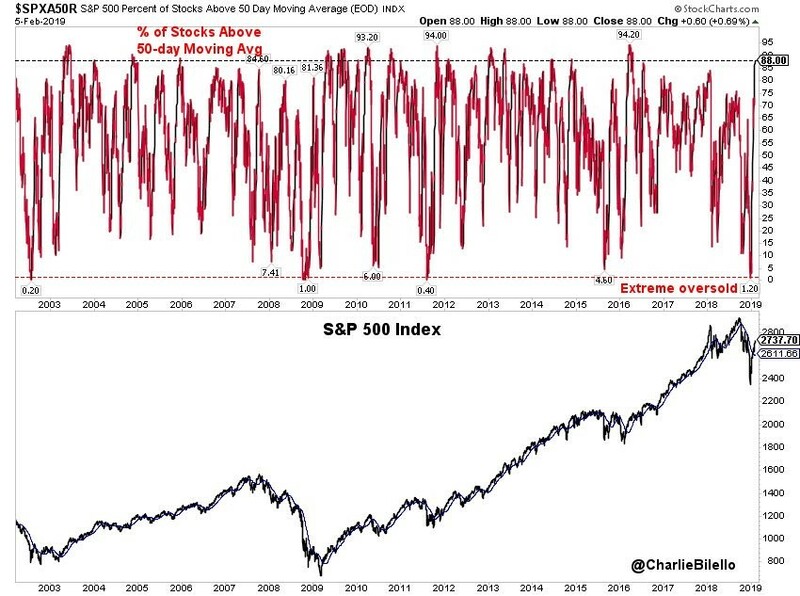 At that pace, it will get above 80 by next week which would make this market one of the most overbought in the past 4 years. When the index has been above 62.5 in the past 4 years, returns have been -0.75% per annum. I expect returns would be even worse if the analysis looked at when the metric gets above 70. Both the Markit and ISM service sector PMIs were weaker than their manufacturing counterparts, but growth was still solid. Specifically, the Markit service PMI was 54.2 which met estimates and was down from 54.4 in December. The rate of new order growth was the same as December which was the weakest rate since October 2017. Activity expansion was the weakest in 4 months. Price pressures fell to a 22 month low which supports the Fed’s decision to hold off on rate hikes. This Markit PMI is consistent with annualized GDP growth of 2.5% which is why I mentioned services growth is still solid. It’s interesting to see manufacturing strong and services weak because manufacturing is more internationally focused. As you know, other developed markets and China are weakening sharply. Global services output fell to the lowest level in 28 months as the PMI fell from 53 to 52.6 in January. The new business index fell from 53.1 to 52.5. It’s no surprise that new export business fell from 50.1 to 49.8 because global trade growth is falling. Just like manufacturing, the future activity index increased; this one was up from 62.1 to 63.1. Results were similar for the ISM non-manufacturing survey. Its PMI was 56.7 which missed estimates for 57.1 and was down from 58 in December. This PMI was below the 12 month average of 58.7 and the lowest since July 2018. Even with this relative weakness and expectations miss, it’s still consistent with 2.8% GDP growth which would be great for Q1 as the estimates I’ve seen have been lower. Just like the Markit report, the ISM reading showed a decline in new export orders growth as the index fell from 59.5 to 50.5. Imports fell from 53.5 to 52.
Business activity and new orders fell 1.5 and 5 points to 59.7 and 57.7. Unlike the Markit report and manufacturing ISM report, the prices index increased 1.4 to 59.4. It’s good to hear a retail trade firm say things are steady because the Redbook same store sales report has shown decelerating growth. However, this is only one firm. If you read these quotes, you would think the government shutdown was/will be a bigger issue that it is. Tariffs are a negative which is why it’s important a trade deal is made by early March. As I mentioned previously, another possibility is delaying the deadline.